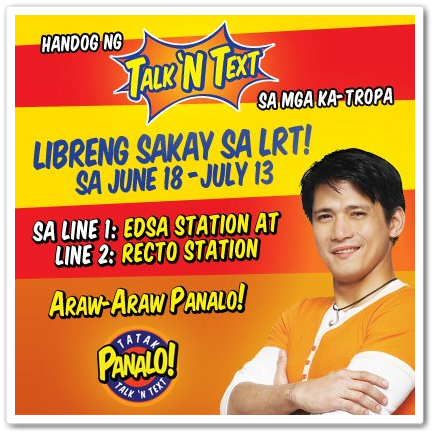 FREE LRT rides offered by Talk N' Text sa mga ka-tropa! Yes! You read it right Tropang Texters ! Around 2,000 to 3,000 FREE tickets will be given away daily. Promo Period: Ongoing until July 13, 2012. Availability: The ticket is only available at LRT 1 EDSA station and LRT 2 Recto station. Good for One (1) way only. Just look for the Talk N' Text booth to get a ticket.